and 118: Oganesson, Og, named after a very important individual*. As you can see, octarine sadly didn’t make the cut. Perhaps the million to one chance rule just doesn’t work so well on roundworld. Oh well. But look, they didn’t completely forget about us! They just misspelled ‘Ogg and Son’. It’s easily done. I’m sure Nanny will still be pleased. *Oganesson actually recognises Professor Yuri Oganessian (born 1933) for his pioneering contributions to transactinoid elements research. But perhaps he’s a distant relative? Follow The Chronicle Flask on Facebook and Twitter for regular updates and other interesting bits and pieces from around the internet. UPDATE: Nature Chemistry have recently released a list of odds for the suggested new element names. Octarine is 1,000,000:1. And since, as we know: “Magicians have calculated that million-to-one chances crop up nine times out of ten,” that makes it practically a dead cert! 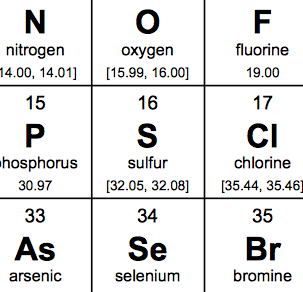 As you will have heard, the periodic table’s seventh row has finally been filled as four new elements have been added. Atomic numbers 115, 117 and 118 have been credited to the Joint Institute for Nuclear Research in Dubna and the Lawrence Livermore National Laboratory in California. Element 113 has been credited to a team of scientists from the Riken institute in Japan. These elements were discovered a little while ago, but the International Union of Pure and Applied Chemistry (IUPAC) – who’s in charge of such things – have only recently verified these discoveries and asked the scientists responsible to suggest names to replace their existing temporary names of ununtrium, ununpentium, ununseptium and ununoctium. So I propose that element 117, falling as it does in group 17 (the halogens), be named octarine, in honour of the late, great, Terry Pratchett and his phenomenally successful Discworld books. I’m also proposing the symbol Oc (pronounced, of course, as ‘ook’*). As a halogen, 117 ought to have an ‘ine’ ending, so octarine makes perfect sense. Over 70 million Pratchett books have been sold worldwide, in 37 different languages, and lots of them concern heroes, gods and monsters. Ok, they’re not quite as old as the Greek myths, but they will be one day, right? Time is relative and all that. Octarine, in the Discworld books, is known as ‘the colour of magic’, which also forms the title of Pratchett’s first ever Discworld book. According to Disc mythology (see, mythology), octarine is visible only to wizards and cats, and is generally described as a sort of greenish-yellow purple colour. Something that’s difficult to find and hard to observe; what could be more perfect? So pop along and sign my petition. Maybe the Russian and American scientists are Discworld fans? You never know. If nothing else I’m absolutely certain that Sir Terry, the author of the Science of the Discworld series of books, would have a little chuckle at the idea. * with thanks to Tom Willoughby for the pronunciation suggestion). Since I started this, one or two devoted Discworld fans have commented that I should have suggested that element 118 be named octiron instead. This is because in Discworld the number 8 has special significance, and also because octiron is the metal which is the source of magical energy, and hence leads to octarine, which is just the colour of magic. But I’m sticking with 117 and octarine. The greenish-yellow purple description seems perfect for a new halogen, and the ‘ine’ ending is just right for group 17. Although octiron also has the right ending for group 18 (‘on’), it doesn’t quite fit since it’s a metal and group 18 is technically made up of noble gases (admittedly, when you’ve only got a couple of atoms of a thing, metal vs. noble gas might be a bit irrelevant). Plus, the fact that octarine is ‘the colour of magic’ makes it seem like a more fitting tribute, this being, as I mentioned above, the title of Terry Pratchett’s first ever Discworld book. So how do you spell element 16? I found myself yet again discussing the correct spelling of the name of element number 16 today with a group of students. Now, on the one hand, going over this again and again is a tad wearisome. On the other, I’m quietly glad that in a time in which the media constantly blather on about terrible literacy levels, rant about the use of txt spk and generally mutter under their (or there/theyre/one of those) breath about the inability of the nation to use an apostrophe properly, I can consistently find an entire roomful of youngsters who care so much about spelling that they’re willing to argue over the correct use of ‘f’ vs. ‘ph’. I am, of course, talking about sulfur. You will note that I have spelled it with an ‘f’. I should point out that the spelling chequer* on my browser has just underlined that with a row of red dots. It disagrees with me as well. However, IUPAC (The International Union of Pure and Applied Chemistry – sounds like a fun place for a holiday doesn’t it?) do not, and in this they get the deciding vote. One of the many things IUPAC does is to sort out the official nomenclature of organic and inorganic molecules. Of course, chemistry professors have been cheerfully ignoring them for years, and so it is that generations of chemistry students have tripped gaily into their first university session, fresh from A-level teachers using systematic names, to be immediately and thoroughly bamboozled by a lecturer talking about acetone, neopentane, para-nitrophenol and the gloriously-named glacial acetic acid. But there it is, when it comes to element 16, IUPAC are crystal clear. It’s sulfur. With an f. That means it’s also sulfide with an f, and sulfate, with an f. Oh and sulfuric, as in the acid, with an f. Interestingly Richard Osman, on the BBC quiz show Pointless, has been very keen to point out in elements rounds that it’s sulfur, and then in a round about acids spelled it sulphuric. Weird. 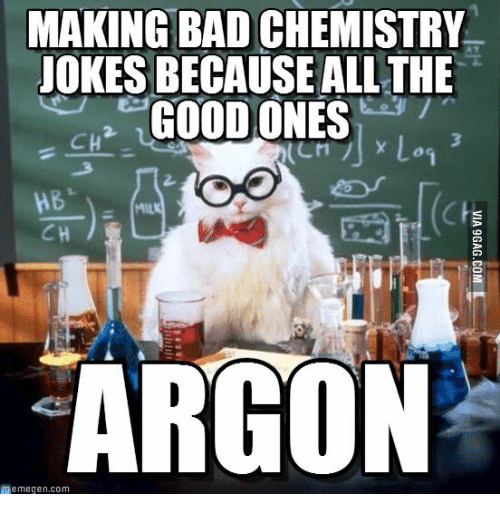 In their notes, IUPAC even say that ‘”aluminum” and “cesium” are commonly used alternative spellings for “aluminium” and “caesium.”’ No such note is made for sulfur. Time to get over it. 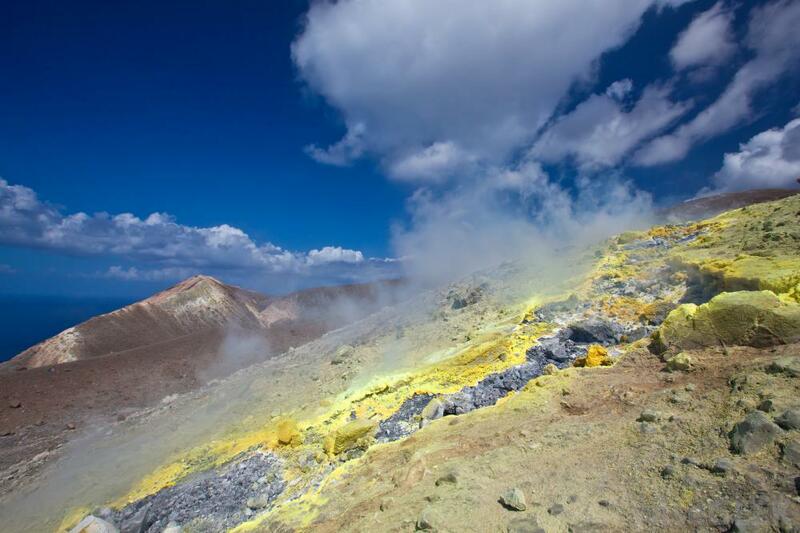 Volcanic sulfur – it looks prettier than it smells. If the Online Etymology Dictionary is to be believed, the ph/f thing has gone backwards and forwards a few times. It was apparently sulphur in Latin, and sulfur in Late Latin. There was an Old English word ‘swefl’ meaning sulfur or brimstone (same thing really, just with more religious connotations), and an Old French one: ‘soufre‘. Actually, according to Google Translate, that’s the modern French spelling as well. I am pretty clueless when it comes to French, so feel free to correct me. The UK started spelling the word with a ph in around the 14th century, along with several other words that have since fallen out of use, such as phantastic and turph. The ph makes some sense in words with a Greek origin, such as philosophy and orphan, since the Greek alphabet actually has the letter phi, but little sense otherwise. However the scribes of the time believed that the more letters there were in a word the more impressive it would look, so they made everything as long and complicated as possible. Why use f when you can use ph? Why spell it ‘tho’ when you can write ‘though’? And you also have them to blame for all those annoyingly unnecessary double consonants that turn up far from occasionally (I absolutely never get that one right first time). If we’re honest, this belief still persists to some extent. True we don’t throw extra letters in for good measure any more, but there are plenty of sesquipedalianist writers out there who believe such behaviour makes them look intelligent (see what I did there?) And just look at how annoyed people get about text speak, or how many quietly sneer about tweeting. So it’s sulfur. With an f. It’s not “the American spelling”. Well, ok, it IS, but it’s also the British spelling. And the rest of the world’s spelling. So add sulfur to your spell checker’s dictionary and let’s move along. * this is a joke. Probably not a very good one, since a number of people have pointed out my ‘mistake’. It’s never a good sign if you have to explain your attempts at humour is it? Anyway, it’s a reference to this famous (well I thought it was, anyway) poem.